Azerbaijani President Ilham Aliyev has always considered the Armenia-Azerbaijan Nagorno-Karabakh conflict as a number one problem and pays attention to this issue, Azerbaijani MP Elman Mammadov told Trend on Jan. 17. Mammadov was commenting on the President's speech at a meeting of the Cabinet of Ministers dedicated to the results of social and economic development in 2018 and the upcoming tasks. 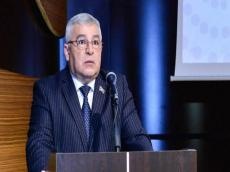 The MP stressed that Armenia is in a serious crisis as a result of the policy being pursued by Azerbaijan to isolate it. "Serious demographic problems also arose in Armenia, which suffered a collapse from both economic and political points of view, residents leave that country," the MP added. Mammadov said that Azerbaijan prefers peaceful settlement of the Nagorno-Karabakh conflict. "International organizations, the OSCE Minsk Group co-chairing countries recommend and even insist on resolving this issue peacefully,” he said. “However, we see that this issue has not been resolved peacefully for almost 30 years. Today, Azerbaijan is strong, we have a strong army and we will liberate our lands from occupation. In his speech, the Azerbaijani president once again drew attention to these issues." Mammadov stressed that the president also pays attention to the issues related to internally displaced people. "The president always focuses on the improvement of living conditions of internally displaced people,” he said. “Today, Azerbaijan continues to pay attention and care about the internally displaced people."